GUNS N' ROSES has extended its "Not in This Lifetime" tour well into 2017 with 35 new stadium dates in Europe and North America. The European trek kicks off May 27 in Dublin, Ireland and concludes July 12 in Nijmegen, The Netherlands. After playing in Tel Aviv, Israel on July 15, the group will return to North America for sixteen shows beginning July 27 in St. Louis and ending September 8 in San Antonio. Tickets go on sale in Canada and Europe on December 9, and on December 10 in the U.S. GUNS N' ROSES has previously announced shows booked in Japan, New Zealand, Australia, Singapore, Thailand and United Arab Emirates between January and early March. 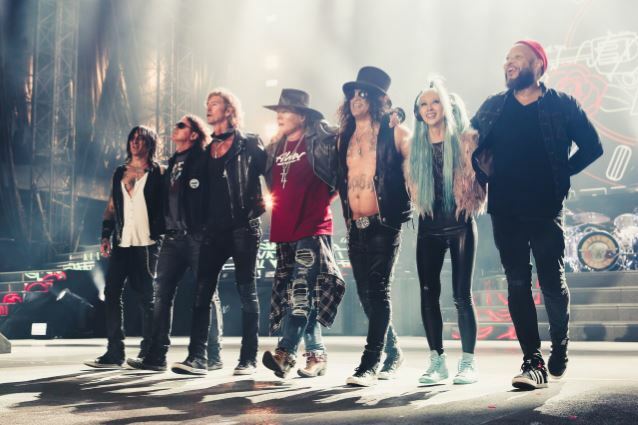 The "Not In This Lifetime" tour features classic GUNS N' ROSES lineup members Slash (guitar), Duff McKagan (bass) and Axl Rose (vocals) backed by drummer Frank Ferrer, guitarist Richard Fortus, keyboardist Dizzy Reed and new second keyboardist Melissa Reese. According to Billboard, the North American leg of the "Not In This Lifetime" summer stadium tour grossed a whopping $116.8 million with over one million tickets sold, a staggering amount for a rock band in 2016. The trek kicked off on June 23 and included 25 concerts in 21 stadiums, wrapping on August 22. Out of the stadiums that hosted the band for two performances, the New York City market produced the top box office counts with ticket sales reaching $11.6 million at MetLife Stadium from 100,177 fans at two concerts. Meanwhile, Chicago's Soldier Field, Gillette Stadium in Foxborough, Massachusetts and L.A.'s Dodger Stadium each topped the $8 million mark in revenue from their two-show stints.